MATANUSKA & KNIK GLACIERS: Millions of years ago these glaciers once covered a majority of the Matanuska Valley. The silt left behind combined with long daylight hours has made the area very fertile - conducive to growing a variety of vegetables, hay and legendary giant cabbages. 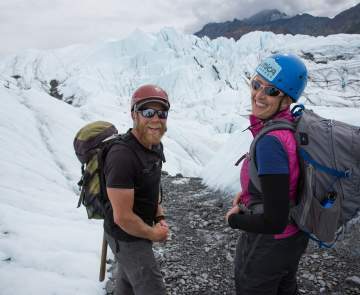 Today, explore the Matanuska Glacier on a trek or ice climb. Easy to get to, it&apos;s one of the few road accessible glaciers in the state. 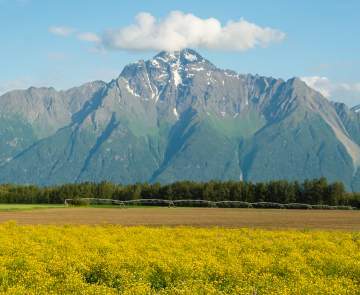 Boat ride or take an ATV tour to the Knik Glacier where spotting wildlife isn&apos;t uncommon. This is only an hour from Anchorage! You can purchase sweet Alaska Grown vegetables at farmers markets or local grocery stores to taste nature&apos;s bounty for yourself. You&apos;ll find the communities of Palmer, Sutton, Chickaloon and Eureka in Glacier Country. To get to Glacier Country travel along the Glenn Highway, on your way to other Alaska communities like Tok, Glennallen or Valdez.